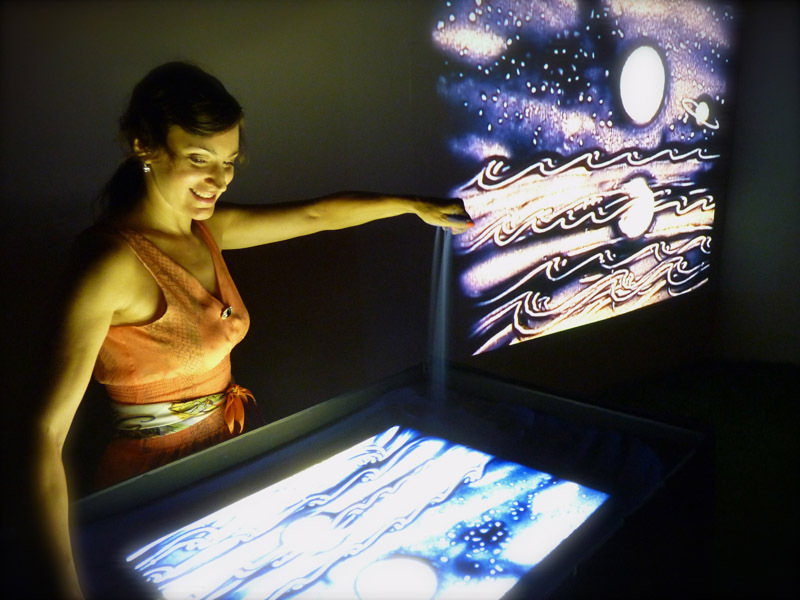 Sand animation is a form of live projection art, which utilizes a glass top table illuminated from beneath. Above the table is an overhead camera, connecting to a high power projector and screen system, providing both entertainment and instruction for today’s modern audiences. While exploring some links between old and new formats, from the Camera Obscura to today’s digital technology, it seems that evolutions in projection technology often make the past fade away, as the future keeps moving ahead…. The Camera Obscura, similar to a pinhole camera, was developed back in 1604. It was a natural optical device using a lens and a very small hole. An image was projected reversed, or inverted, in a very dark room. It was often used as a drawing or painting aid. In 1640, Athonasius Kircher, with his Magic Lantern, made one of the first attempts we know of to project drawings onto a wall. He drew onto separate pieces of glass, which were projected as static images. The glass plates were then moved from above with strings to change the scenes. The Kaleidoscope was invented in 1815, which is an amusing ornamental toy with philosophical origins. The natural philosopher, David Brewster, designed it’s ever changing abstract patterns by accident when he saw reflections between plates of glass, bringing awareness to the underlying symmetry of nature. It is an optical instrument with crystals, mirrors and reflections, which is placed over one eye and rotated, creating beautiful changing patterns. The Stereoscope of 1838, much like the modern Viewmaster, brought the viewer “closer “ to a scene with its spatial dimensions. When looking into it, two separate images merged with the eyes to create a single 3D image, which was considered quite fascinating at that time. Eedweard Muybridge’s 1879 Zoopraxiscope was an early device created to display motion pictures, and may be the first movie projector. It projected stop-motion silhouettes and images, painted onto rotating glass discs, moving in a rapid succession, to give the impression of motion. Many of his films showed complex animal and human movements. In 1889, Edison’s Kinetoscope showed films, viewed by one person at a time, through a peephole viewer. It was not a movie projector but was instrumental to the birth of the American cinema culture. Jenkins & Armat’s Vitascope projector, first demonstrated in 1895, went from being called a toy to an instrument or machine. Considered natural magic with practical applications, and with equal emphasis on both amusement and instruction. The year 1894 saw the joining together of engineering, electricity and chemistry. This began the mechanical transfer of the animator’s world onto the screen. By 1895, with the Birth of Cinema, the creation of virtual worlds were then filmed. The first use of animation in movies began when Georges Méliès built one of the first film studios in 1897. He went on to create over 500 films, mostly short one-shot films, produced in just one take, including A Trip To The Moon in 1902. German silhouette cutout artist, Lotte Reiniger, started creating animated title cards in 1917, around age 18. She invented the multiplane camera in 1923, with her husband and creative partner Carl Koch, using multiple sheets of glass to create depth. This multiplane camera was used for her first color animation "The Adventures of Prince Achmed", released in 1926, which was considered to be the first avant-garde full-length animated feature. She made more than 40 films with her invention. In 1928, Mickey Mouse took off with Steamboat Willie, the first cartoon that had synchronized sound. Soon after, in 1932, Disney released it’s first full color film Flowers & Trees, followed by Snow White and the Seven Dwarfs in 1937, which was their first feature length film. Snow White raised cartoon drawing to the level of art. Sand animation was invented in 1968, by Caroline Leaf, for her project at Harvard University. Her first animated film was "Sand, or Peter and the Wolf", which she created by moving sand with her hands on an illuminated glass surface. By the late 1990’s, sand animators began demonstrating their works of live animated art to large audiences, adding a projector and screen. The sand artist’s projected, live, storytelling performances explore the relationship between real and virtual spaces, and create emotionally immersive environments which provide both entertainment and instruction. Live sand animations are currently projected large scale onto a mega screen, using the latest in digital technologies, and synched to a live or recorded soundtrack. Are you fully utilizing the projection screens at your venue? You can add a futuristic, artistic and informative element to your event with a living sand animation, the latest trend in projection art.